Think idyllic, sandy coves, swaying palms and wide, white beaches; think Brazil, Thailand and…yes, think Corsica. The French ”Ile de Beauté” boasts around 1,000 kilometres of glorious coastline and close to 200 beaches washed by the warm waters of the Mediterranean. You’re never far from unspoilt coast in Corsica, most of which basks in National Park status. Whether you like pebbles, golden, white, coarse or fine sands in hidden coves or bustling beach resorts, Corsica really has it all. Most beaches are easy to access but there’s also something magical about walking along the coastal paths and stumbling across a deserted cove. 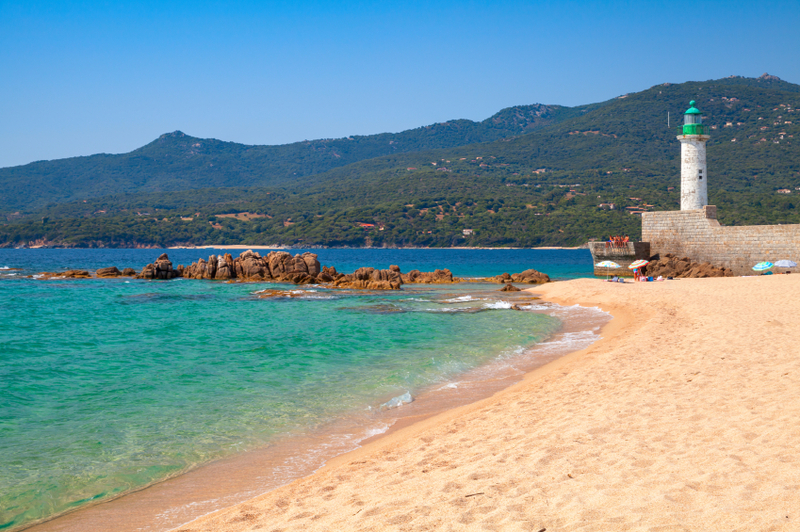 Corsica’s beaches are incredibly clean, more than equalling many of the best resorts in France or Spain. Whether you’re on a secluded bay or one of the busier town beaches, you’ll always find pristine nature both on the beach and in the water. Water sports are particularly good here too, thanks to the island’s position in the Med bringing a keen wind and sensational surf. Which beaches are best for you? That, of course, depends on what you like and where you’re staying. But here are some of our favourites, bearing in mind that with hundreds of beaches to choose from, it’s impossible to provide a definitive guide here and there will be plenty more you might like to add to this list once you get there. Cupabia packs a punch with its huge open bay, white sands and a marvellously mountainous backdrop. This is a wild and wonderful beach with plenty of space on the sands, with the added curiosity of wandering cows during low-season. You can access Cupabia via the small, winding road from the village of Porto-Pollo. Capo di Feno is a favourite among the locals. It’s a large, unspoilt bay edged with rocks and mountains and you’ll find space to lay your towel here, even during peak season. A surfer’s paradise, Capo di Feno has the convenience of sand banks and a reef running up to about 100 metres off the shore. Access is via two one-way roads which zigzag their way through the hills, both of which start at the nation’s capital, Ajaccio. Roccapina, as the name suggests is perfect for rock lovers. It’s a small bay with turquoise water surrounded by red rocks spilling into the sea. Look out for the famous “Lion of Roccapina”, a lion-shaped rock which dominates the bay. To get there, take the unpaved, rough road leaving the main road at the guest house “Auberge de Coralli” – if you’d prefer to save your car from the rocky road, the short walk down to the beach is also manageable. Campomoro village sits on a cosy, quiet bay famous for its crystal clear waters. The traditional Corsican granite houses at the water’s edge provide unique character to go with the great swimming. Saleccia et Lodu – Desert des Agriates – is undeniably one of the most scenic beaches you will come across on the island. Expect Robinson Crusoe-style remoteness plus white sand, transparent waters and gorgeous sand dunes. For a journey that’s well worth it take a 12 kilometre hike or go off-roading, you can also get there by boat from St Florent harbour. For yet more seclusion, try the neighbouring Lodu and Ghignu beaches. Ostriconi is one of the most accessible beaches in the Desert des Agriates area and sits on the extreme left of the desert’s coast where the Ostriconi River flows out to the sea. This is another wildly beautiful turquoise watered, white sandy beach, where you’ll feel particularly at one with the open sea, its winds and lively surf. Lozari has a wilder touch than some of the beaches off Corsica, with its steeply shelving shoreline, strong currents and awesome waves. If you are looking for peace and quiet then this stretch of picturesque beach is a great place to unwind. Calvi is ideal for shallow, crystal clear water and white sands, with the added benefit of picture-perfect views of Calvi’s Genovese citadel. Being near to the town means you have many water sports, eating, drinking and partying facilities close by. Moriani is spacious and ideal for families, thanks to shallow waters, easy access and parking. If you are staying in the northern part of the east coast, it’s one of the most popular places to stop for a day at the beach. Mare e Stagnu – Aleria is another place for great views. Here you can enjoy uninterrupted stretches of sand and scenic views extending from the sea to the popular “Etang de Diane”, and onwards to the lake’s mouth with its Genoese tower prettily dominating the surrounding landscape. Pinarellu Bay sits seven kilometres north of Porto Vecchio. This place has a unique feel with its 500-year old Genoese tower sitting on a small island in the middle of the bay and the fragrant pine forests which surround it. White sands and transparent, knee-deep water make Pinarellu one of the most popular beaches in the Porto-Vecchio area. Palombaggia, dubbed “the most beautiful beach” in Corsica, sits a few kilometres south of Porto-Vecchio. This beach is popular and easy to access. Expect a combination of white sands and clear waters, surrounded by picturesque pine trees and red rocks. You will also find plenty of eateries, bars and water sports to keep you entertained. Rondinara is named after the roundness of its bay and is often known as the “little sister” of Palombaggia. Like Palombaggi, it boasts fabulous turquoise coloured sea, along with red rocks and the characteristic pine forests of the surrounding area. Santa Giulia is a quiet, white sandy bay perfect for a little respite from the summer crowds. A long stretch of knee-deep water makes this spot good for children and those who like to walk through the gently breaking waves, while a pleasant wooden pier also juts out into the water. Santa Giulia is popular for water sports, especially windsurfing and kite surfing, and has a restaurant on the beach where you can pull up a seat and watch all the action. Santa Manza is the place to come for fresh air, rejuvenating coastal walks and spectacular sea views as you amble through green trees and maquis. The coastal tracks are well-marked and can lead you to a succession of several snug beaches. The views are sure to get your camera clicking. Barcaggiu lies at the extreme north of the island and is great for wild winds and bracing walks. With a bit of off-roading you’ll find yourself amid breath-taking beauty. There’s also a quaint restaurant at the entrance to the beach which is used by some hikers tackling the “sentier des douaniers” (the coastal path).